This light dessert is beautiful and goes well after a heavy meal. Try it out! • Preheat the oven to 350 degree Fahrenheit. • In a small bowl, toss together almonds, cherries, cinnamon powder, nutmeg powder, wheat germ and brown sugar until they are evenly distributed. • Leave the apples unpeeled. Remove the core of each apple working from the stem and stop at 3/4th inch from the bottom. • Divide the cherry mixture equally and press it gently into each cavity of the apple. 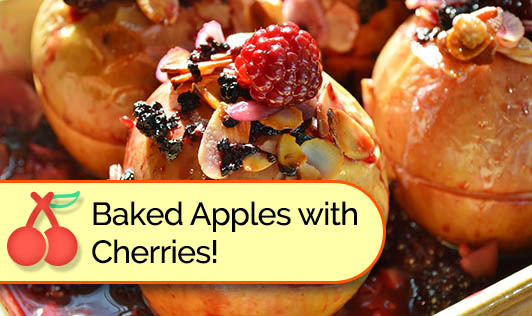 • Arrange the apples upright in a baking dish, large enough to hold them. • Pour water and apple juice into the pan. • Drizzle honey and oil evenly over the apples. • Cover the pan snuggly with an aluminium foil. • Bake them for 50-60minutes or until tender. • Transfer apples to individual serving plates and drizzle with the pan juices. • Serve warm or at room temperature.